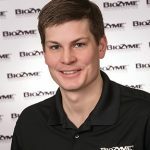 Brett Tostenson, Highmore, S.D., has joined the team at BioZyme® Inc., as an Area Sales Manager. In his new role, he will represent BioZyme working with dealers, potential dealers and end-users in South Dakota and eastern North Dakota. Tostenson has a strong background in the cattle industry. He was raised on his family’s commercial cattle operation in west-central Minnesota, and he spent the last 7 ½ years working for TransOva. He has a bachelor’s degree from South Dakota State University, where he dual-majored in animal science and business economics. “Brett has the passion and drive to help the commercial and purebred cattleman. He understands that feeding a value-added mineral program can help the bottom line,” said Mike Wadle, BioZyme Director of National Sales. “For the number of cows in state of South Dakota, I am really eager to grow our business in the state. I’m looking forward to growing dealerships and looking for influencers that will use and talk about the products,” Tostenson said. Tostenson and his wife, Laura, have a young son, Holden. They also run a small herd of registered Angus and Simmental cattle, and market heifers and bulls privately and through consignment sales. They also market embryos and flush opportunities on their Angus and Simmental donors at national and international levels.